Construction industry in Malaysia experienced a steady growth due to significant government spending on construction and infrastructure projects, keeping the demand for diesel gensets in the construction domain afloat. However, with carbon emission reduction targets set at 40% by 2020 and at 45% by 2030, the growth of the diesel genset market in Malaysia is expected to be sluggish over the coming years. The commercial and manufacturing sectors occupied significant Malaysia diesel genset market share in 2017. Malaysia is emerging as a new manufacturing hub with many global companies setting up new manufacturing units in the country. The booming aerospace manufacturing industry, in particular, would act as a catalyst for the growth in demand for diesel gensets in the manufacturing domain in Malaysia. The Malaysia diesel genset market report thoroughly covers the Malaysia Diesel Genset market by KVA ratings, applications and regions. The Malaysia diesel genset market outlook report provides an unbiased and detailed analysis of the Malaysia diesel genset market trends, opportunities/high growth areas and market drivers which would help the stakeholders to device and align their market strategies according to the current and future market dynamics. •	Historical Data of Malaysia Diesel Genset Market Revenues for the Period, 2014-2017. •	Malaysia Diesel Genset Market Size & Malaysia Diesel Genset Market Forecast of Revenues, until 2024. •	Historical Data of Malaysia Diesel Genset Market by KVA Ratings for the Period, 2014-2017. •	Market Size & Forecast of Malaysia Diesel Genset Market Revenues by KVA Ratings, until 2024. •	Historical Data of Malaysia Diesel Genset Market Revenues by Applications for the Period, 2014-2017. 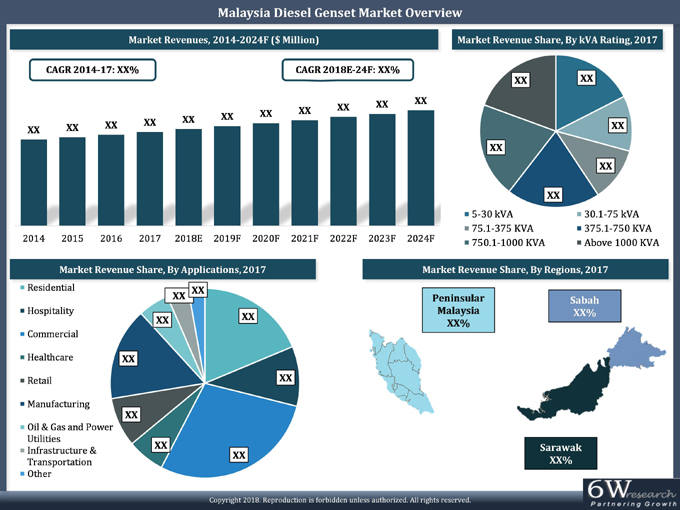 •	Market Size & Forecast of Malaysia Diesel Genset Market Revenues by Applications, until 2024. •	Historical Data of Malaysia Diesel Genset Market Revenues by Regions for the Period, 2014-2017. •	Market Size & Forecast of Malaysia Diesel Genset Market Revenues by Regions, until 2024. •	Malaysia Diesel Genset Market Trends and Developments. 14.9 Yanmar Holdings Co. Ltd.